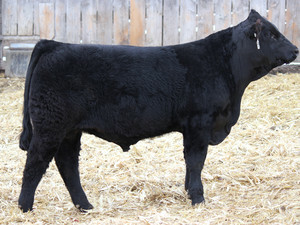 YOUNGWOOD is a thick, attractive and high-performing black son of TORRINGTON who descends from an outstanding cow family. Out of a heavy-milking first-calf daughter of MAC SEMINOLE, he combines a birth ratio of 98 with a weaning ratio of 109. You'll appreciate his performance, thickness, style, correctness and outstanding disposition.